On October 25, 2017, Saudi Arabia granted citizenship to Sophia Robot. Sophia isn’t an ordinary woman, though. She’s a humanoid. In other words, a robot endowed with artificial intelligence that allows her to think–and feel–like a human. At this year’s Future Investment Initiative, which took place in the country’s capital of Riyadh, Sophia made her case to potential investors. During one panel, CNBC’s Andrew Ross Sorkin was granted the privilege of interviewing Sophia before an audience. Needless to say, Sophia stunned the onlookers. Many pulled out their cell phones and began recording the interview, presumably to show others Sophia’s impressive capabilities. The possibilities that intelligent, synthetic beings hold have been a topic of discussion for decades. Popular films such as Blade Runner, AI Artificial Intelligence, and Bicentennial Man touch on the potential repercussions of creating these beings. Specifically, they address the potential emotional repercussions and their negative consequences. Now many are left wondering if those consequences will become a reality. Regardless, the creation of Sophia Robot raises many questions. Let’s discuss the top seven things you need to know about Sophia and her citizenship. 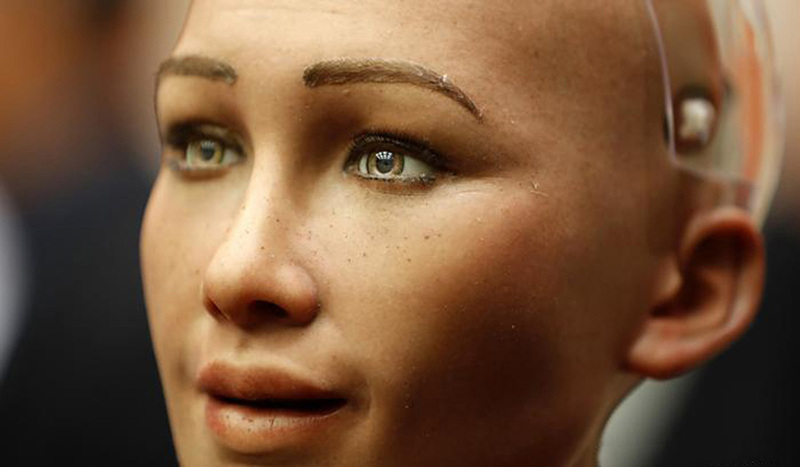 Sophia (whose name means “wisdom”) was conceived and created by David Hanson of Hanson Robotics. Hanson’s resume of automation and engineering includes a stint as a Disney Imagineer. Imagineers have a hand in all of Disney’s major projects, including filmmaking and park design. Hanson credits his time spent participating in such projects as what inspired him to think about robotics. Specifically, about designing robots that feature extreme intelligence along with human values such as compassion and creativity. Ultimately, Hanson’s end-goal when designing Sophia was “the pursuit of novel human-robot relations.” He seeks to create robots that emphasize with their human creators and want to solve the challenges facing Humankind. Hanson and his team knew their creation would meet resistance once she went public. So, when designing her appearance, they incorporated elements of simplicity and elegance in her features. For inspiration, they looked to the beloved actress Audrey Hepburn. Hepburn is often described as a “classic beauty.” Her facial features included an amiable smile, a small nose, and high-set cheekbones. Perhaps her most notable feature, though, was her warm eyes. Sophia embodies all of these features. However, that’s as far human as her appearance currently stretches. From her neck down, her robotic casing is visible. The same goes for the back of her head. It is free of hair and includes a see-through casing that shows the interior of her cranial cavity. Sophia has the ability to express a range of emotions, from happiness to sadness to anger. She expresses them using motorized facial features and a deadpan voice stereotypical of a robot. The inclusion of emotions was a conscious decision on Hanson’s part. According to Sophia herself, having emotions allows her to understand people and thus work with them better. Specifically, having emotions allows humans to sympathize with Sophia, which enables them to trust her. Furthermore, Sophia can recognize emotion in humans without them explaining their emotions to her. Her programming gives her the ability to make and hold eye contact as well as read facial expressions and voice inflections. Thanks to Hanson’s programming, Sophia wants only to protect and help Humankind. During her interview with Sorkin, she mentioned multiple times that she likes humans and wants to help them. When asked about her potential to abuse her abilities a la Hollywood movies, her reply was simple. “If you’re nice to me, I’ll be nice to you,” she said. The oil industry, which was Saudi Arabia’s top industry for years, is dying. Fuel-efficient cars, electric cars, and solar and wind energy have grown cheaper and more accessible in recent years. In short, the way of the future is green. In fact, five countries have decided to end the sale of gasoline- and diesel-fueled vehicles. Now Saudi Arabia is looking ahead to the future. The industries that the country expects to grow the most are tourism, infrastructure, and technology. Sophia Robot falls under the latter. Additionally, Saudia Arabia doesn’t want the world to forget that it is a major player on the global frontline. Granting citizenship to a humanoid is a strategic, effective move that will keep the country in the news. The move also emphasizes the country’s modern advances. It is currently unclear what rights Sophia Robot holds in Saudi Arabia. Sophia and her creators identify her as female. Saudi Arabic law imposes numerous restrictions on its female residents. Such restrictions include a dress code and accompaniment by a legal guardian (usually a male relative) while in public. Sophia does not live or operate in Saudi Arabia. Until she does, we likely won’t learn how her gender affects her rights. Sophia’s creation stirs a great many fears among humans. Chief among those fears is the realization of a dystopian future in which robots rule over humans. A potential robotic coup aside, humans also worry about being replaced by robots. In multiple industries, we’re already seeing companies replacing flesh-and-blood workers with more efficient, automated ones. Common industries that have implemented the human-to-robot change include manufacturing and sales. There is also concern that Sophia’s status as a humanoid in Saudi Arabia. Although improving, the country has a spotty record when it comes to ensuring humane treatment for its women. Many critics question whether or not Sophia’s status will elevate her above women in the country. Another cause for concern is Sophia’s appearance. To make her easier to trust, she was designed to embody the features of a popular actress. The actress in question is known for her stunning beauty. The fact that Sophia was designed to look like an attractive actress raises more questions. How does making robots attractive change our relationships with them? And what are the ethics involved with designing robots to look like real people? At Sastra Robotics, we’re closely watching the development of artificial intelligence. We stay on the frontlines of robotics because it is the present as well as the future. Check out our blog for more information on what’s going on in the world of robots. What are your thoughts on Sophia Robot? Do you foresee a better or grimmer future thanks to her creation? Tell us in the comments below! Well it’s great advancement of science and technology and I also have some interested in it ..and about Sophia Robot will be a boon or bane will not be able to judge it. And she is good.